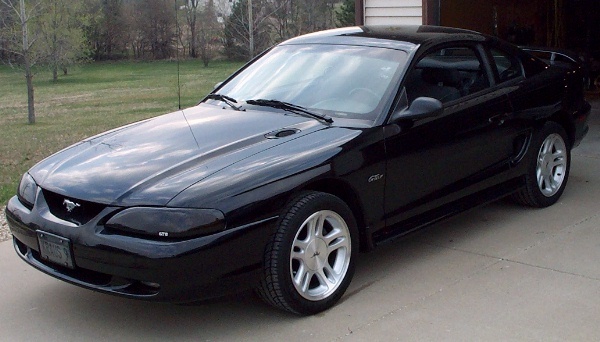 This is Tim Kraushaar's 98 GT. I recommended and installed the Allen supercharger kit. Although I always thought the Allen kit would be great, this was the first Allen kit I installed. The install took 2 days making it the hardest system I have installed to date. To it's credit however, it is everything I expected as far as quality. There are several precision cast and machined aluminum parts which were very well done. 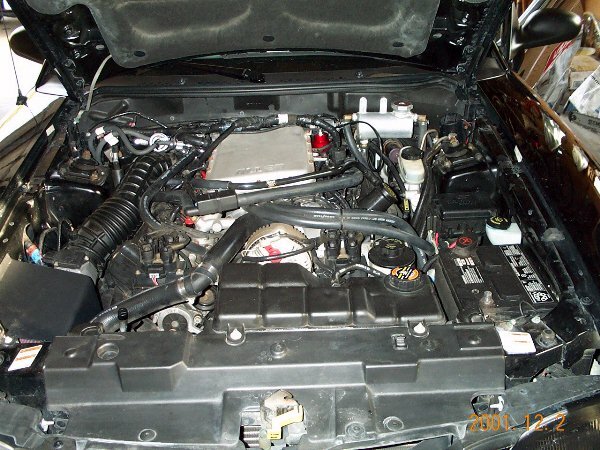 It made use of nearly all the real estate at the rear of the engine V where the intake manifold originally was. It also drove as I expected. Throttle responce was excellent as was the power delivery from one end of the tach to the other. Without any modifications to the timing, there was very little ping even on regular unleaded. With premium fuel the ping was under control. The blower was silent until you went into boost. Then you would hear it but it was still not loud at all. The intercooler pump was a bit noisey however and it ran all the time. It turned out the first pump we got was faulty and Allen quickly sent a replacement that was much better. I would definately recommend this kit again. Out of all the kits I have installed, this was both the hardest and the most worthwhile. Allen has a unique FMU setup. It has a control rod that goes into the vacuum port of a regular fuel pressure regulator. Under boost, the upper diaphram will push the rod down causing the fuel pressure to rise just like any other FMU. This FMU was removed however when the MAF and fuel injectors were upgraded. 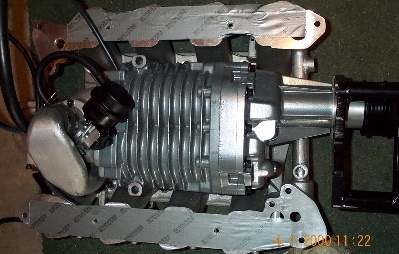 Below is a picture of the bottom of the blower showing the bypass valve. The IAC and EGR are also tucked below the intake manifold to a throttle boday adapter housing which attaches to the back of the blower.